This week we bring a more eclectic show, as promised. We bring the latest offerings from several artists: Jeru the Damaja, Black Devil Disco Club, Autechre, Lifesavas & Songs of Green Pheasant. Lots of other stuff in there crossing future music boundries: hip-hop, dance, experimental, dub, and ambient packed into a compact hour. I’m not exactly sure how else to describe this show. Totally electronic: some for the dancefloor, some for the morning after. We bring a maximum techno show here with newer stuff from labels like Warp, Rephlex, Planet Mu, and Skull Disco. More organic grooves will be back next week! This week we bring an extended 2-hour Internet only show. We aired the 1.24 show on WCRS this week in order to catch up the radio listeners with the online version. We spent the night in the studio with the volume cranked up with some great experimental sounds. New stuff this week from Autechre, Caspa & Rusko’s Fabric Mix and Thom Yorke’s remixes EP. Joseph also turned me onto Alan Braxe, and I think thank him for it! 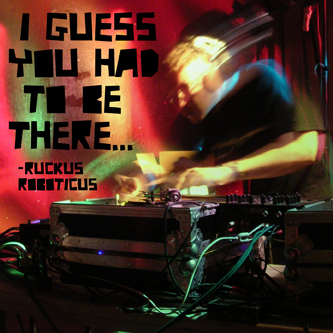 Ruckus Roboticus is back with another guest mix this week, this time bringing you a four-to-the-floor dance mix. Ruckus will be bringing his record crates to town this Saturday night, spinning at the Britsol Bar. Next week we’re dropping a special Internet-only extended show!